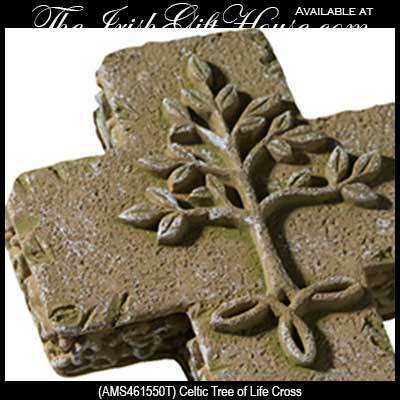 Celtic wall cross features the Tree of Life along with Trinity knots and a blessing. 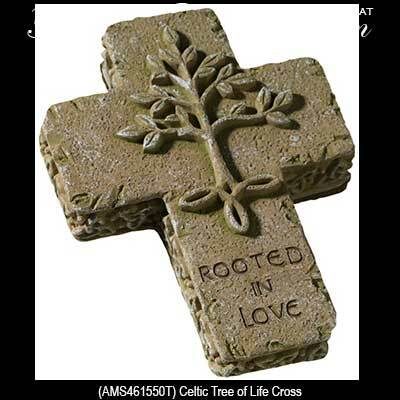 This Tree of Life wall cross includes the blessing, Rooted in Love. This Celtic wall cross features an embossed Tree of Life along with a blessing and a Trinity knots motif along the sides. The Tree of Life cross is made of weather resistant cement and resin combination that suitable for outdoor use and measures 3 1/4” wide x 4 1/2” tall. This Irish cross is gift boxed with Tree of Life, Celtic knot and Celtic cross history cards, complements of The Irish Gift House.